Borussia Dortmund coach Jurgen Klopp says he will not quit despite taking "full responsibility" for his team's slump to the foot of the Bundesliga. 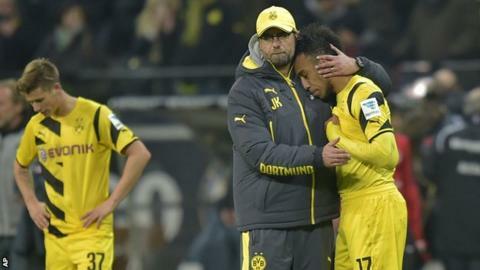 "There's no tendency for a coaching change," said Klopp, who led Dortmund to the 2013 Champions League final. "Until someone comes along and tells me otherwise, I can't go away. I can't go until there's a better solution." Klopp, who steered Dortmund to back-to-back German titles in 2011 and 2012, has watched his side cruise into the Champions League knockout phase by winning four of their five Group D matches. But their domestic form has been totally different with the team losing eight matches in their worst start to a German top-flight season. "If it was only based on luck, and if a coaching change was guaranteed to bring the luck back, then I wouldn't stand in the way," Klopp added. Frankfurt captain Alexander Meier - the Bundesliga's top scorer - fired in the early opener with his eighth goal of the season. And a mis-timed header from Dortmund defender Matthias Ginter allowed Switzerland striker Haris Seferovic to out-sprint visiting goalkeeper Roman Weidenfeller and tap in Frankfurt's second. Dortmund, who have 11 points from 13 matches, dropped to the bottom of the table on Saturday after Werder Bremen and Stuttgart picked up wins over Paderborn and Freiburg. Match ends, Eintracht Frankfurt 2, Borussia Dortmund 0. Second Half ends, Eintracht Frankfurt 2, Borussia Dortmund 0. Timothy Chandler (Eintracht Frankfurt) wins a free kick in the defensive half. Substitution, Eintracht Frankfurt. Sonny Kittel replaces Stefan Aigner. Attempt missed. Matthias Ginter (Borussia Dortmund) header from the centre of the box is close, but misses to the left. Assisted by Henrikh Mkhitaryan following a corner. Corner, Borussia Dortmund. Conceded by Martin Lanig. Substitution, Eintracht Frankfurt. Aleksandar Ignjovski replaces Takashi Inui. Foul by Martin Lanig (Eintracht Frankfurt). Attempt missed. Henrikh Mkhitaryan (Borussia Dortmund) left footed shot from outside the box is high and wide to the left. Assisted by Adrián Ramos. Sven Bender (Borussia Dortmund) wins a free kick in the attacking half. Foul by Alexander Meier (Eintracht Frankfurt). Marco Russ (Eintracht Frankfurt) wins a free kick in the attacking half. Stefan Aigner (Eintracht Frankfurt) wins a free kick in the defensive half. Martin Lanig (Eintracht Frankfurt) is shown the yellow card for a bad foul. Foul by Bastian Oczipka (Eintracht Frankfurt). Kevin Großkreutz (Borussia Dortmund) is shown the yellow card. Anderson (Eintracht Frankfurt) wins a free kick in the defensive half. Corner, Borussia Dortmund. Conceded by Felix Wiedwald. Attempt saved. Ilkay Gündogan (Borussia Dortmund) right footed shot from outside the box is saved in the top right corner. Foul by Marco Russ (Eintracht Frankfurt). Goal! Eintracht Frankfurt 2, Borussia Dortmund 0. Haris Seferovic (Eintracht Frankfurt) left footed shot from the centre of the box to the bottom right corner following a fast break. Matthias Ginter (Borussia Dortmund) is shown the yellow card for a bad foul. Foul by Matthias Ginter (Borussia Dortmund). Stefan Aigner (Eintracht Frankfurt) wins a free kick on the right wing. Takashi Inui (Eintracht Frankfurt) wins a free kick in the defensive half. Offside, Eintracht Frankfurt. Felix Wiedwald tries a through ball, but Stefan Aigner is caught offside. Substitution, Borussia Dortmund. Milos Jojic replaces Shinji Kagawa. Substitution, Borussia Dortmund. Ilkay Gündogan replaces Sebastian Kehl.